For a limited time, you can snag the base version of Battlefield 3 to keep forever. Well, EA seems to be taking with one hand and giving with the other today, announcing that Battlefield 3 is now completely free for everyone to download and add to their libraries as part of Origin's "On The House" program. For a limited time, anyone with an Origin account can simply head over to the Battlefield 3 store page and add the game to their library, where it will stay forever. Players have until June 3 to add the game, after which it will go back to its regular price. The offer is only for the base version of the game, without any of the DLC packs included in the premium bundle. EA kicked off the Origin On The House program with Dead Space at the beginning of March, and continued with Plants Vs. Zombies in May (which, is actually still free until tomorrow). 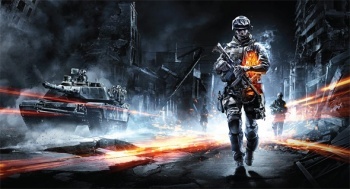 Unlike the other games, Battlefield 3 will only be free for a week, so you'll have to act fast! BF3, though coming on three years old now, still holds up pretty well. In fact, some would say that it's a more polished and enjoyable experience than the more recent Battlefield 4, so its definitely worth picking up if you don't already have it.